The raccoon smear set is one of my favorite sets to use when trapping an area that has either a culvert, cement foundation under a bridge, or steep ditch banks along a stream or river. Basically you can make this set anywhere there's a vertical structure that allows you to simply smear some bait on it and set a trap below. Raccoons are well known for their curiosity and their desire to explore. These traits make them one of the easiest furbearers to trap, especially when you're around water. Raccoons, mink and muskrats love to travel under bridges and through culverts. 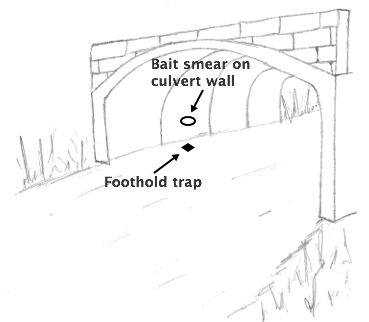 These funnel points are often the best spots to set a trap. However, the cement foundation under a bridge or the metal edges inside a culvert limit what kind of set you can make. At these locations, the smear set works great. In fact, once you start using it and realize just how productive this set can be, you'll be looking all over for bridges and culverts to make another set. The raccoon smear set is so easy to make that many trappers try to make it more complicated than it needs to be. When trapping raccoons it's important to keep things simple. To construct the set, take a lure and smear it on the vertical wall about 2 feet above the waterline. For a lure you can use fish oil, a commercial bait or even raspberry jam mixed with honey which will help it smell sweet and stick to the wall. I like to use a fish scented lure because mink commonly cross through the same area and the fish odor is sure to grab their attention. Once you have about a 6 inch circle of lure smeared on the wall, set a #1.5 foothold trap below the lure about 3-4 inches out from the wall. When the raccoon walks up to the smeared lure it will be shuffling its feet all over as it tries to reach up and paw at it. It's not uncommon to have a rear foot catch at these sets since the raccoon is moving back an forth on its hind feet scratching at the wall. It's important to securely stake the trap. Many times the bottom will be soft or sandy which makes it hard to stake the trap. If this is the case, try using 2 cross stakes for added grip. Another great set to use under a bridge or inside a culvert utilizes cement blocks. If you're unable to securely fasten the trap a cement block works perfect. You can use the block in your set and tie the trap to them since they're too heavy for a raccoon to drag away. Cement blocks are heavy and hard to carry so this works best when you can drive close to the set location. Take the cement block and stand it upright along the vertical wall of the bridge. 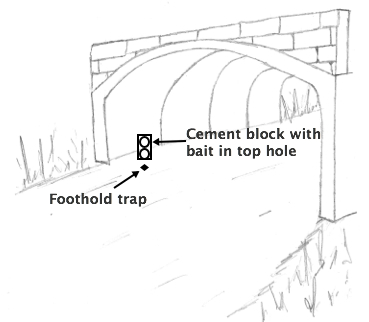 Place your bait in the top hole of the block and wire the trap through the bottom hole. Try to set the backside of the block flush against the vertical wall to prevent the raccoon from accessing the bait from the backside. I like to use cable when wiring a trap to the cement block because the cement is abrasive and could crimp and brake trapping wire. Finally, place your trap in front of the block and you're done! The raccoon smear set works great anytime you're trapping an area that has a vertical structure. It only takes a few minutes to create and it's a set every trapper should consider when targeting raccoons along a stream or river.